BOSTON, MA -- The Eastern Hockey League Premier (EHLP) returned to action for the first time since January 13th, and despite a decent break in the schedule, the players didn't skip a beat. 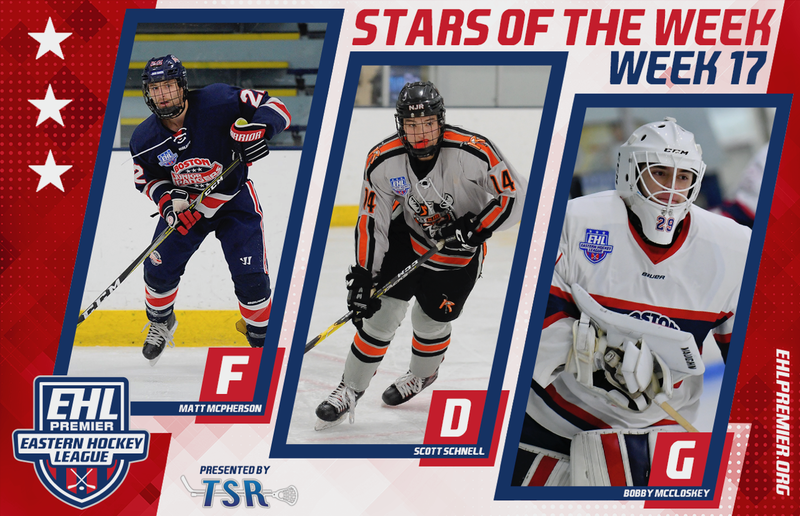 The EHLP is pleased to announce that Matt McPherson (Boston Jr. Rangers), Scott Schnell (New Jersey Renegades), and Bobby McCloskey (Boston Jr. Rangers) have been named the TSR Hockey Stars of the Week. 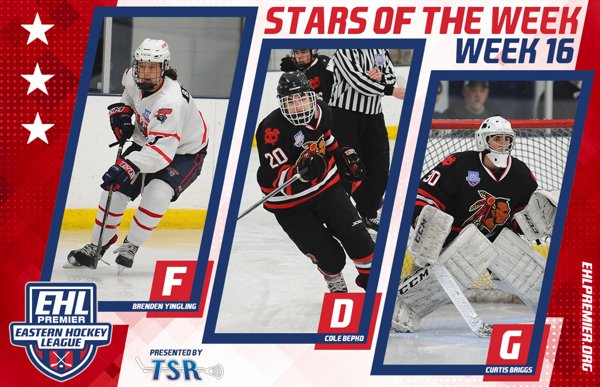 The next set of TSR Hockey Stars of the Week will be released on Tuesday, February 5th. Remember to catch the #Eshow all season long on HockeyTV. McPherson and the Rangers hit the ice for just a single game this past weekend, but they took care of business with a 6-1 victory over the Walpole Express on Saturday night. The '99 forward from Somerville, MA played a role in all six goals for his team, scoring four times and collecting a pair of assists. For the season, McPherson now has 22 goals and 18 assists through his first 30 games. The Rangers are once again at the top of the New England Conference, but they do find themselves in a very tight battle with the New England Wolves. The Rangers have won two of the first three EHLP Championships, and the year they didn't take home they title they fell just short in the EHLP Finals. Flipping over to the Mid-Atlantic Conference, and this past weekend went perfectly to plan for Schnell and the Renegades. New Jersey swept their home-and-home series with the Philadelphia Jr. Flyers, as they picked up victories of 11-2 and 6-3 over their conference rival. With the pair of wins, the Renegades moved themselves into the 5th and final playoff spot in their conference. As for Schnell, the the 2000-born native of Flemington, NJ collected four assists for his team, running his overall point total up to 33 for the year. Schnell earned a pair of assists in each matchup, as he extended his current point streak out to ten games. Looking ahead, the Renegades will need to keep the momentum rolling if they want to remain inside the playoff picture. The Renegades are set to host the in-state rival New Jersey 87s tomorrow night at 8:15pm, and then each of the next two weekends, they will battle the Philadelphia Revolution in a pair of home-and-home series. While McPherson helped pace the offense, McCloskey held things down between the pipes, turning aside 30 of the 31 shots that the Walpole Expresssent his way. Since returning from the holiday break, the 2000-born native of Marblehead, MA has started and won each of his matchups. Combined together, McCloskey has turned aside 62 of the 64 shots that have been sent his way so far in 2019. This the 4th honor of the season for McCloskey (TSR Hockey Stars of the Week #2 -- October Star of the Month -- TSR Hockey Stars of the Week #10), as the 6'5 netminder looks to play a key role in his team's run towards another EHLP Championship. Looking ahead, the Rangers hit the ice for a trio of games this weekend, as they take on the Express again on Friday, followed by matchups against the Connecticut Chiefs (Saturday) and the Valley Jr. Warriors (Sunday). Keeping the pattern rolling, we will wrap things up by giving an honorable mention out to Adam Marvin of the New Jersey Renegades. Playing in his first two games of the season with the Renegades, the forward found the back of the net four times, and added another five assists on top of that. It's also worth noting that his hat-trick on Sunday, included the game-winning goal against the Philadelphia Jr. Flyers.